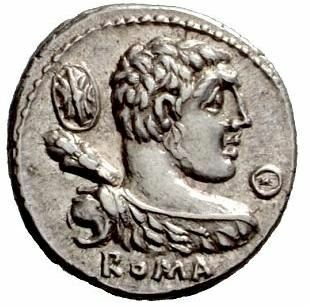 Publius Cornelius Lentulus Marcellinus was one of the moneyers for the year 50 BC. His namesake was moneyer in 100 BC. Lentulus Marcellinus was a commander under Julius Caesar, and was later Consul when the Senate transferred power to Emperor Augustus. The cognoment 'Lentulus' was associated with Gens Cornelia, and literally means 'slow'.